Rare Voting System Flips House Seat! The ranked-choice system, approved in 2016, lets voters rank all candidates from first to last on the ballot. If no one gets a majority, then last-place candidates are eliminated and their second-place votes are reallocated. In this case, Poliquin and Golden both collected 46 percent of first-place votes, with Poliquin maintaining a slim edge of about 2,000 votes. But additional tabulations were triggered because no one collected a majority. On Thursday, Golden overtook Poliquin after state election officials eliminated two independent candidates who trailed, collectively gathering about 8 percent of first-place votes. A computer algorithm reallocated the second-place votes, giving Golden a lead of nearly 3,000 votes. In my opinion any voting system that does not count an individual’s vote for, “none of the above” has a major flaw. Probably would not be considered if they knew how to fairly count the votes. If the ballot is all screwed up throw it out. If the machine doesn’t read the dot it is because it was not filled in , that equals no vote. Strict deadlines period . This scheme was not about the validity of votes cast, it assumes the same interpretation of intention on the ballot marking. And this is only one of the ways they manipulate elections. It's ends-justifies-the-means power grabbing all the way down -- from voting to disrupting congressional hearings to violating free speech to harassment by thugs and more. This worsening, ugly trend from the radical left controlling the Democrat Party is increasingly frightening. Republicans, especially those focusing on voting strategy analysis, is well aware of the trend in manipulation, but don't know what to do. They haven't even been able to effectively counter the lefts' accusations of "voter suppression" as requirements for legal voter registration. Seems like a process designed to pick back up the votes lost to third party candidates that usually tend to bleed away Democrat votes. Election rigging if I ever saw it. Since it helps Democrats, it will survive court challenge.....unless we can show that it hurt a minority or illegal voter......Oh come on...I forgot...no one really cares about them minorities and illegals....the only thing important is helping Democrats take beck their rightful power. Convoluted? Sounds almost rational to me as long as the process is transparent and not misused. OTOH, it would also allow "Bernie" socialist votes to be reallocated to socialist Democrat candidates. The article says the "ranked choice system was approved in 2016." I wonder who "approved" it: state legislators or voters? But the result could instead be that more people vote their real first choice instead of choosing the lesser of 2 evils (Dem/GOP) and the third party candidates actually have a chance to get the votes they deserve. Would you vote for an objectivist candidate as first choice and GOP as second choice if you knew it would eventually go to the GOP candidate in a close race? Like all things political it will be misused. I think the people will do the opposite and only vote R/D in the future. Besides, who says the alternative candidates approved whom their votes went to, we might see the opposite here too. alternative candidates joining the mainstream parties. I'd be pissed as a libertarian if my votes went to a demoncrap because they were the second choice of the voters. You get to choose who the 1st choice, 2nd choice, 3rd choice, etc. is on your ballot. That is how they are allocated, by the individual voters choice. 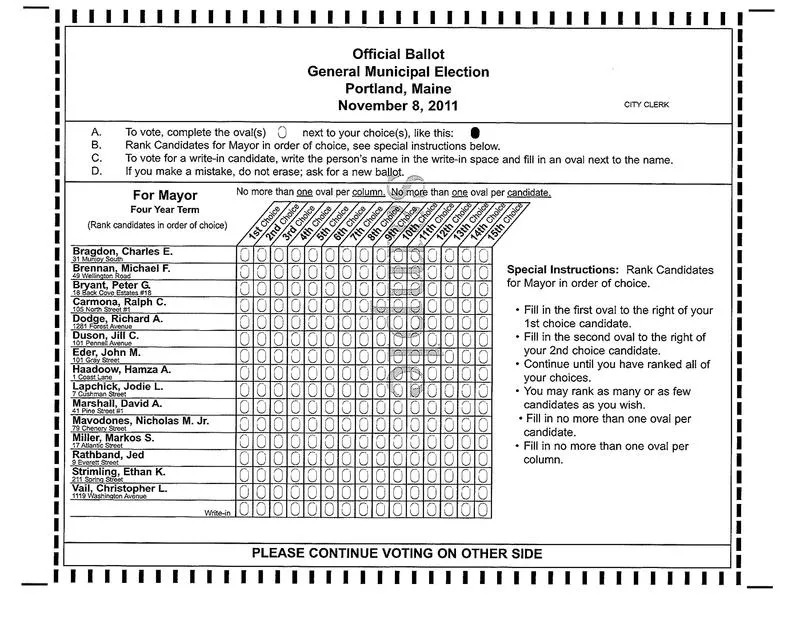 Here is an image of the Maine ballot showing that you choose the ranking. It does depend on the computer being programmed correctly to only re-allocate votes of those voters whose first choice is not one who got a lot of votes. That is not very difficult to program correctly. I see your point but now we are dependent upon the computer and can you imagine how complex a hand recount would be if the computer goes down or gets it wrong? Hell, they can't even handle a simple stupid system. The convoluted part is the “reallocation”. The proper way to do this is to do a runoff among the top, say, three choices. Removing candidates would, by definition, alter how people would rank among the choices they have. Removing candidates from consideration is essentially a different ballot. To do anything short of returning said new ballot to the voters is manipulating the ballots. Consider a functional alternative: a majority requirement but if nobody gets a majority you merge “libertarian” candidate votes into Republican candidate, and Green to Democrat. People would rightly and loudly howl about this. Yet it is what they are doing when they “reallocate” votes. There is no way to definitely just remove a candidate and shift votes upward. While it may sound far fetched the reality is that people can and do choose a different rank order when you remove a higher ranked candidate. Hell, we do it when lower ranked choices are removed. If you really wanted to avoid a runoff under the describe system the less-bad option is to assign points to all ranks and tally points rather than votes. Still worse than a simple runoff. Oh and NOTA should always be an option. If NOTA wins, hold a new election and those on the ballot that NOTA won on are ineligible. Yes, they evade that people's choices depend on who the candidates are on the ballot. A scheme that tries to change choices under different circumstances is rigging, not voting, and in this case in Maine the political and ideological motives for implementing the scheme are in the open. The system was initiated by progressives who did not want their votes split, allowing their opposition to win with the most votes. If someone does not want to waste his vote on a fringe candidate who cannot win then he shouldn't waste his vote that way. Voting is for selecting who will be in office, not making a vague "statement", and not for having it both ways. The progressives want various radical candidates so badly that they have traditionally cast their votes that way; now they want an automatic do-over to keep coming back for the most progressive candidate they can get after they lose. These are the same collectivist activists who become hysterical over voter id laws ensuring legitimate voting, which they call "voter suppression" (of the dishonest mob). The rights of the individual are not supposed to be up for grabs in any election, let alone made even more vulnerable to rigged elections schemes on behalf of collectivists. The Maine 'ranked choice voting' was declared unconstitutional by the state supreme court for in-state elections because the constitution specifies the winner as the plurality of votes. But the court allowed the voting of Federal representatives to stand as 'ranked choice', as if the constitution was intended to make a distinction and to allow a voting maneuver that no one had ever heard of at the time the constitution was written. The claim by the left that this 'system' of rubber choice voting is somehow superior because it requires a majority rather than a plurality for three or more candidates is propaganda by democrat socialists appealing to their premise of mob rule. Over half the people typically don't vote at all, and majority votes are still not a majority of the citizens. Nor does "ranked choice" allow voters to know what the alternatives are that they choosing between in 2nd choices. Nor is the mob "majority" the proper standard at all. Again, our rights are not supposed to be for grabs by some mob in every election, and this rubber choice voting scheme was cynically implemented for that purpose. Polequin has sued in Federal court. The judge refused to issue an injunction against proceeding with the altered counting, but the case is still active. Welcome to the real world. Ranked Choice voting has now produced a perverse result. The least popular candidate has been "elected". Every voting system will do this, as the founders knew https://cic.nyu.edu/sites/default/fil... . That's why the picked the simplest system, "First Past The Pole". Computers are supposed to simplify our lives, but they always seem to complicate them instead. The more we have, the more we want. That’s just human nature. We have to live with others understanding that. Others attempt to scramble human nature for all humans. I'm sorry, I may be dense, but your post has only confused me more. Do I need an interpreter? We want faster and faster computers which can allow us to do more and more things making those things we used to do easier. And they do. But others raise the complexity ceiling higher and higher. Not only do we have more choices but each of us is expected to do more and more. As an example take a look at the original, single and simple tax form before computers. Now, look at the nightmare that each of us is expected to compute for our rulers. It is human nature to want more and to compete. It is human nature to want to be free to choose. It is not human nature to want less and all be equal. It is not human nature to want to be ruled. Forcing individuals to make omelets of equity, multiculturalism and diversity will require breaking untold numbers of eggs, until human nature itself can be somehow scrambled. That is unless we can live with others, understanding human nature, and the totalitarian. I love metaphors. You've got some doozies. So...the increasing complications are the responsibility of the increasingly complications brought about by the desire of mankind's wish to accomplish more, in less time than previous models. I wrote that after drinking a few glasses of apple cider mixed with Captain Morgan rum. It still came out rather well. You should read what I write after enough Jack Daniels on the rocks. On second thought, maybe you shouldn't. Just glad I could help clear it up for you. Like getting your credit card to work in a store instead of handing the clerk an uninflated quarter. But computers have made much more complex activity possible and practical that could not be otherwise done all. But this voting scheme is not from computers; in principle it could be imposed with any method of counting, including flying chads. It requires counting more than once, with different votes selected for the 2nd and subsequent passes. In Maine, small rural downs did count the votes manually. I love my computer. But, there are times when I think that it is the only rational one. Does that make me a freak? Maybe you have a freak computer. Don't let it vote. It is my understanding that places such as Ireland routinely do that. They are not locked into the 'two party' system as we are. It makes sense to me. When you vote, you rank candidates putting your favorite at top and working down the list. Especially useful when there are 4 or 5 running for a seat. We are so enamored of 'the two party system' that it is hard for a lot of people to even consider that it stinks! Why do I have to choose between a dummycrat and a republicon? I prefer a No Party system...debates to eliminate all but two candidates, ALL of which that have extensive knowledge of the constitution and the bill of rights...then we choose. Oh, I must have been writing in my sleep...sorry, I am awake now...it was just a dream. The Constitution says nothing about political parties but they are unavoidable. People naturally band together and organize for their positions in government. The essential difference now is that when the Constitution was ratified there was broad agreement on the nature of government as limited to protecting the rights of the individual in a free society; today the parties and their supporters represent different degrees of statist philosophy instead of how to implement the proper conception. Every election puts the philosophy of government up for grabs, all of it contrary to the original conception. Even if a plurality is considered to be too small, it does not follow that this "ranked choice" reflects who voters would support if they knew who the choices were. I prefer the run-off system to this. I don't consider a preference the same as a vote. That was kind of my thinking as well. At least for run-off elctions, where they are required, the voters know who is on the ballot they are choosing among in the run-off election. It's actually a superior voting system IF the voters understand how it works. I am not opposed to this unusual form of voting. The candidates and constituents knew the rules before the election. Thanks, no I haven't, my understanding is limited, at first glance it seems it would help undermine the current two party monopoly. And maybe Oakland is 99% progressive left anyway. I see a lot of good here. Mshupe. I’m sure that you’ve seen the quality of Oakland mayors that have been picked using this system.